How to develop "Word Choice" in your writing. Writing is a tool for communication, and language is the system of words and the methods of combining them that we use to express our thoughts and feelings to each other. Did you know that good writers use certain traits that make their writing more successful? They’re called the Traits of Effective Writing, and although they take a lot of hard work and practice, they consist of skills that can be learned and mastered. I’ve written about Vocabulary, Voice, and Sentence Fluency in previous blogs, but today, I’d like to speak specifically about Writing Trait #3: Word Choice. Word Choice is selecting appropriate words to make a writing piece stand out. Good writers think carefully about words and choose them wisely: how a word sounds when it’s read out loud, how it looks on the page, how it works with the other words around it, and how precise and unique the word is. They avoid overusing the same words that everyone uses, and they find fun and descriptive synonyms to make their writing unique. Creating a space in a notebook to write down fun and unique words, expressions, and literary devices for future use. Teaching students to use a thesaurus to find synonyms and a dictionary to make sure they are using a word correctly and spelling it right. Teaching students to use “Power Words” to create word pictures in the reader’s mind. These exercises help students learn to use precise nouns, active verbs, descriptive adjectives, and strong adverbs. These words help show the reader instead of just telling them. Incorporating activities to expand a student’s vocabulary. These word choice strategies teach students to think about words and understand that they have word choice options. As they become skilled writers, they learn to choose their words carefully. Use precise nouns and verbs to engage the reader’s imagination. Use vivid adjectives and adverbs to create strong mental pictures. Use prepositional phrases to add more detail and description. Add or replace any weak words with stronger word choices. Delete any repeated or unclear words. To write clearly and effectively, students must learn to find the words that fit their meaning exactly to convey their thoughts and feelings. Why not teach them how to choose powerful, effective words, using Shurley English? How to develop "sentence fluency" in your writing. Some people are born with a natural ability to put their thoughts into words, but the ability to effectively put those words on paper requires a lot of hard work and practice. Good writing is a skill that develops over time; therefore, consistent instruction to develop the knowledge and skills necessary to write well is imperative. That’s where Shurley English makes a huge impact! Each year, our curriculum teaches and reinforces the Traits of Effective Writing so that students have a better chance to develop a strong foundation in the writing process. The curriculum is designed to teach students how to communicate their thoughts effectively and write for all purposes with competence and confidence! Sentence Fluency is the 5th Trait of Effective Writing. It is defined as the ability to use various types of sentences and transition words to make writing sound smooth and polished. The skills required to master Sentence Fluency take time to develop; however, they make a huge difference in the overall effectiveness of a writing piece. We encourage you to help your students master the art of sentence fluency. If you need assistance, the Shurley English curriculum is here to help! 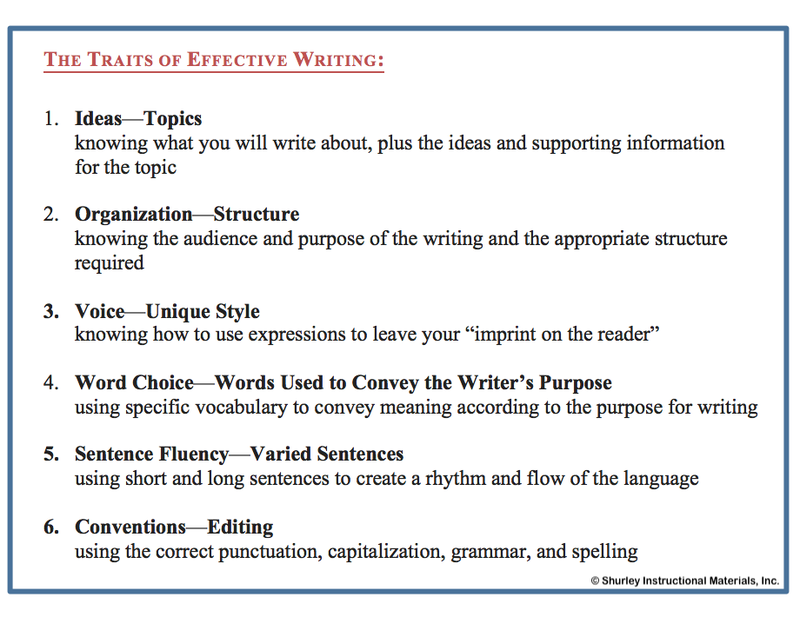 In the 1960’s, a researcher by the name of Paul Diederich asked a group of language arts professionals a simple question: “What makes writing effective?” As the responses rolled in, Diederich was able to configure them into six distinct traits and coined them as the Traits of Effective Writing. Amazingly, these six traits are still being used today as a framework for teaching and assessing all types of writing at every stage of writing development. Teaching “voice” doesn’t have to be difficult! The key is to establish clear goals and objectives to help students understand and apply the 3rd Trait of Effective Writing. Today, I will provide you with some background information and give you a few tricks to help students effectively demonstrate voice. Let’s begin with the definition. “Voice” is the individual way a writer expresses himself or herself; it’s that personal, unique style of using words and expressions to convey meaning in a way that jumps off the page and leaves the writer’s imprint on the reader. The same words and expressions that tend to flow freely during conversation are often difficult for writers to express effectively. One reason is because there are no set rules for “how” or “where” to include “voice” in a piece of writing. Teachers need to understand that words and expressions that convey voice do not always magically appear. 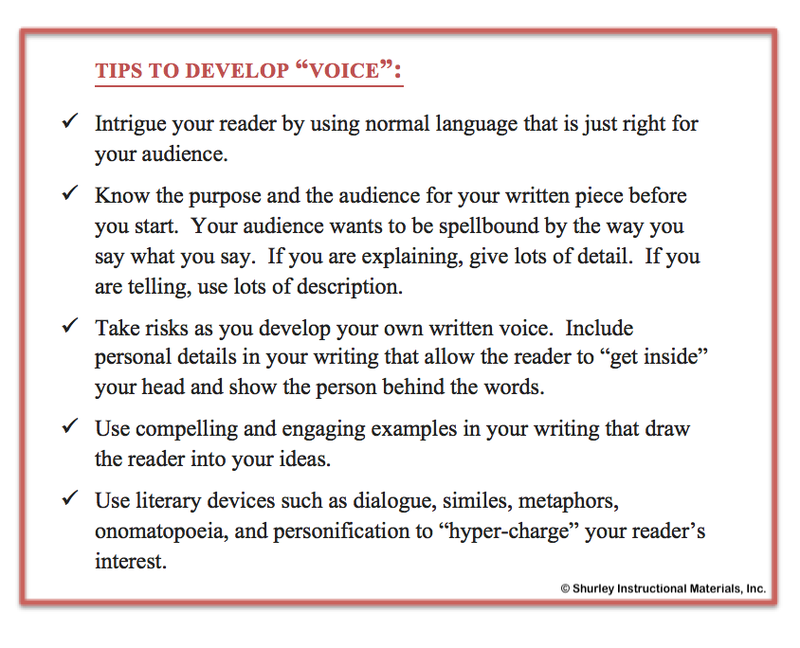 Students must be taught how to apply voice in their writing. Good modeling is important. As students’ knowledge, skill, and practice pertaining to the use of voice increases, their personalities are sure to shine through. It’s up to you to nurture the development of voice and help students hone their skills by providing lots of practice!